All right, this is just not pizza. I mean, maybe it is pizza-like or pizza-esque or even pizza-ish, but I have a terrifically hard time calling it pizza. In fact, when I saw Giada DeLaurentis make this on her Food Network show last weekend (I seem to have broken a seal with her, no?) all I could think was “that’s not pizza!” and then hmm, that would be a fun Sunday night dinner. So, I did the only rational thing: I decided to not call it pizza. In fact, as soon as I started to think of this as a flat bread, an open panini or an assembly of some of my favorite things, the deliciousness near-overwhelmed me. So, let us take this apart, shall we? We start with a thin layer of pizza dough. You can use my easy-as-sin one, though I have myself moved onto the just as easy wine-and-honey version I updated a few months back. If you don’t feel like making your own, I’m really not doing my job here, but nevertheless, feel free to pick up one from your local pizza joint (what, you don’t have one on your block?) or grocery store. 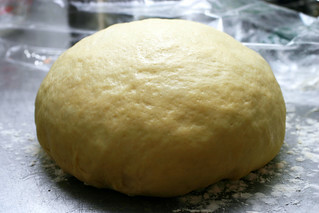 The recipe calls for a one-pound dough, though my homemade one clocked in at 13.5 ounces and, lo, the world did not end. You sprinkle it with mozzarella and crumbled gorgonzola, something we’d been lucky enough to pick up that morning from Murray’s Cheese. Meanwhile, you have roasted lightly sweetened and seriously spiced slices of acorn squash, which cooks much faster and is much easier to take apart than butternut. Once your crust is baked and the cheese is bubbly and brown, you spread the roasted slices of squash on top and sprinkle arugula on top and voila! Despite thinking–as you probably are right now–that this was the weirdest dish in the world, we loved it. It was the perfect light meal with salad and a hearty vegetable right on top of a little decadence. We drank some wine, bit our fingernails watching The Wire and fantasized about going to Rome this spring where we are sure to see no “pizza” of this sort. But, you know what? Their loss. Slice the squash in half from top to bottom. Scoop out the seeds. 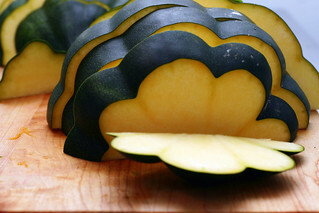 Slice the squash into 1/2 to 3/4-inch wide half moons and place in a medium bowl. 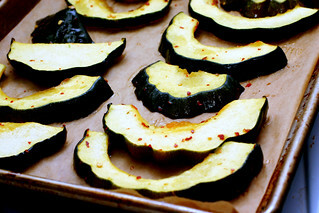 Toss the squash with the syrup, olive oil, red pepper flakes, 1/4 teaspoon salt, and 1/4 teaspoon pepper. Place the squash on a parchment-lined baking sheet. Bake the squash until tender and golden, about 20 to 25 minutes. Keep the temperature on the oven at 375 degrees F. Roll out the pizza dough on a flour dusted piece of parchment paper to a 13-inch diameter. Place the pizza and the parchment paper on a baking sheet. Sprinkle the mozzarella cheese and the Gorgonzola on the pizza dough. Bake in the oven until golden and cooked through, about 25 to 30 minutes. Peel the skins off the squash. Top the cooked pizza with the cooked squash. Toss with arugula with the squeeze of lemon juice and the remaining 1/4 teaspoon salt and pepper. Slice and serve. Oh YUM! I love Murray’s Cheese and that “pizza-ish” pizza looks so good! See you tomorrow night! What should I bring? Oooooh, I watched that episode too! Looks so yum. This looks awesome and not weird at all to me. Giada is starting a new show (presumably after she has her baby). Production is going to cease on “Everyday Italian”. She wants to spread her wings a bit. Recipes like this evidence that she is definitely stretching sometimes to make things “Italian”. i had the exact same response to that show… not pizza, but it looks damn good. glad to know it turned out well in real life, because i’ve got an acorn squash sitting in my fridge that’s just waiting to be sorta-pizza-fied! I love untraditional pizzas like this. 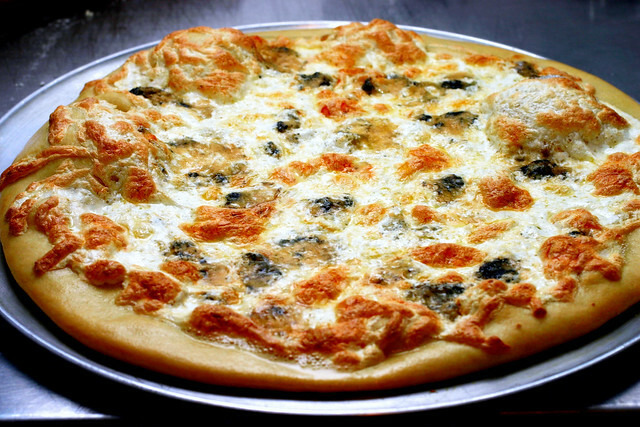 Have you answered the ‘make ahead” pizza dough problem yet? I’ve searched the Smitten to no avail. Is there a better food than pizza/flatbreads? I don’t think so. This looks just awesome — I have yet to find a pizza dough recipe I like, so I will take a look at yours for sure! maple syrup, gorgonzola, red pepper flakes, acorn squash and arugula on pizza dough. swooning, i’m swooning here! Mmmm, I love this combo. I made a pizza (based on one I’d had at a restaurant) last fall with cheese and walnuts and smears of delicata squash. The cheesy-salty-sweet combo is just. so. good. And the bright orange of the squash makes it pretty! The photos are breathtaking! How do you cut your squash? I can’t seem to manage it with a knife. This looks gorgeous. The last time I used this combination of ingredients was in a quiche (a very awesome quiche), which makes me think that this would be an even easier way to go. I am just not a pie crust girl, but pizza dough? That I can do. Thanks for the lovely post! we just had acorn squash last night! I split one in half and roasted them upside down submerged in a thin layer of water, and once out of the oven, I sprinkled kosher salt, slathered some butter on top and oozed some honey on top. yum!! the hubby ate all of his piece- a miracle! I have so many of your posts pinned my other blogs are getting jealous! This looks awesome and will be on the menu for next week. I’m thinking I will be the only one who likes it in my house but oh well – their loss! I made this a few months ago using whole wheat pizza dough and it was delicious! does the squash get watery when it roasts? the last time I made acorn squash I had to let it drain before putting it in a quiche, because there was a lot of residual liquid. But this does look delish! The funny thing is that this past summer in just outside of Rome I actually had pizza with argula and squash on it at a pizzaria known for their strange toppings. I am not sure what kind of squash it was (I did not recognize it) but… it was delicious. That looks awesome! I love how the acorn squash looks like a flower. Wow, I saw that episode and thought about making it too. Looks delish. Just saw the Giada pizza show…looks yummy. You would be right about Rome but not about Venice. My favorite pizza ever was in Venice and it was called the Unique. It was gorgonzola, banana and ‘salad’ which just usually means arugula or something similar. Oh my god it was amazingly delicious. That was the only restaurant we ate at twice. YUM. This sounds wonderful! I’ve never had acorn squash but I bet this would be good with some butternut squash as well. 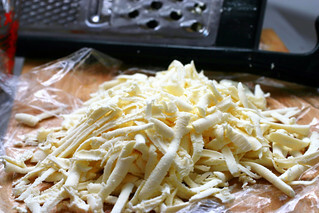 I think instead of shredded mozzarella you should really use fresh mozz. You’ll need to find a good deli to get it from and it’ll blow any normal pizza out of the water! Weird?! no way. squash + cheese + spinach = absolute heaven. Fontina is particularly great with squash, though stronger, so I may try this subbing a less amount of that for the mozzarella. Sounds heavenly! This sounds really good. The salty gorgonzola would go well with the sweet squash and maple. Hmmm, that looks and sounds delicious! Deb, awesome! I can’t wait to try it. I don’t think I can get butternut squash here but I’m so excited to try it…I’ll try just about any kind of squash. And I love your pizza crust recipe. It’s my go-to one, since I live outside the US in a land where they don’t seem to know how to make decent pizza crust! Thanks to you, I DO! It sounds interesting and lovely. I love Gorgonzola. Deb, how do you get your pizzas to be so gorgeously round? Mine always end up elliptical, even when I get friends who work at pizzerias to give me pointers. I don’t think this is the weirdest dish in the world, far from it. It looks delicious. I love acorn squash, I can never resist one if I see them, so beautiful to look at. Pizza or no pizza… it looks delicious to me! What are those black spots on your cooked pizza (pre squash and arugula)? Is that just the gorgonzola, or did you sneak something in and try to get away with not telling us? Tell us the secret ingredient! gorgonzola and acorn squash? i think i love it. i really need to get a stone so i can start making pizza at home, i’ve seen so many yummy looking versions in the food blog world over the past few weeks. One of my favorite restaurant meals is Pear and Gorgonzola pizza at California Pizza Kitchen. This seems on the same planet! I will have to try it! Love the first shot – that green spinach struck my eye and made me jump! Looks delicious. i have to tell you i’m so excited i stumbled upon your blog! i’m now inspired to get back in the kitchen and my friends together over good food. this one is first on the agenda! although murrie’s used to be across the street…and now i’m in brooklyn. Tried this tonight because it looked so great. I went ahead & made the crust last night and just left it partially uncooked, popped it in the fridge and then finished the recipe as described. Yum, great job Deb and whoever! I’d definitely do more squash & arugula next time. I made this last night…We’re in Alaska, so arugula and acorn squash can’t be had locally, so I used what I could find at the store, and added smoked salmon to provide a little dose of salty local flavor. It was damn good. Recently found your site and am very excited to be part of your world! What beautiful photos and great recipes! What a pleasure to read! I especially like knowing that you are one of the (formerly) dedicated fans of The Wire! I just made this pizza tonight using a few shortcuts (pre-shredded cheese, pre-made dough from a local pizza place) and it was SO yummy! My mom and I ate nearly all of it ourselves. She wants me to make just the squash for her again soon. Sorry I didn’t take any pictures for the Flickr pool – next time! Oooh that acorn squash looks like a flower! Nice job on the homemade pizza! Oh, this was fantastic! I rubbed a white whole wheat crust with a little olive oil and minced garlic first which added a great flavor. I made a similar pizza a few months ago using spaghetti squash flavored with nutmeg (http://green-lemonade.com/local-pizza-pizza). This looks so good I emailed it to my husband with a message that just said, “OMG! YES! !” I can’t wait to try it, maybe even this weekend. This caught my eye when I was browsing through your blog. Lacking any firm plans for dinner, I decided to pick up the necessary ingredients. I committed the culinary sin of just using a Boboli, as dough has always been my nemesis, and I used about 4 oz. of gorgonzola. What an amazing combination of flavors! The salty, thick tang of the gorgonzola was contrasted by the fresh green arugula. Sadly, my maple syrup was gone when I started to make the squash, so I had to use “pancake syrup.” Definitely not the same. I look forward to making this pizza again and again. I just made this and it was great!!!! Perfect flavor combination. I made it with the full teasp. of pepper flakes and I think that a half would have been better. I love cooking spinach directly on my pizzas, so I tried putting the squash and arugula both on the pizza as it went in the oven. The squash cooked well this way, but next time I would marinate it first. (I baked for the whole 30 mins.) The arugula, on the other hand, got way too dry. Next time, I’ll put this on with a few minutes to go, and perhaps save some of the mozzarella to go on top of it and allow the flavors to blend. Two other things: the marinade works great as a salad dressing, and some might prefer the squash if it were cubed. Thanks, Deb. I love your blog, having only discovered it last week via David Lebovitz’s post on pickling carrots. just made the recipe, which was delicious. but i really had a hard time peeling the squash. the skin wouldnt just peel off so i had to cut it off and it was very tedious. is there any helpful hints on how to peel an acorn squash? I’ve made this twice from the Food Network, and then misplaced the recipe, which is how I stumbled across your great site. I also don’t call this a pizza… and actually, I find that this is even more declicious if I use a 9×13 glass baking dish instead of a parchment coated pan, and serve it ‘deep dish’ style, which keeps the arugula from falling off. I just found this recipe browsing your site and made it as an appetizer when we had a few guests over on sunday night. it was a smash hit, every last bit was devoured, absolutely delish! I can’t wait to try this. I love new takes on pizza recipes. Maybe a Boboli pre-made pizza dough would work? It is nice to balance out the carbs with yummy veggies! I have been wanting to try this recipe for awhile. Can anybody recommend a good place to get “red pepper flakes?” I have bought a couple different types, and they never seem to add any discernible flavor so I figure I must be buying the wrong kind. Mine look like what you’ll find in table shaker at a pizza joint and are labeled “red pepper flakes” but I can’t help but wonder if there’s something else out there I should be using… Thanks! This is in my oven right now making my apartment smell fan-TAS-tic! This is my first crack at pizza dough but I have no doubt it’s going to be as good as it smells… if I can stop snacking on the squash long enough for the pizza to come out! I hit “Surprise Me” on the front page this week and landed here, and hooray! I made this last night and it was great! I loved the simplicity of it and the subtle flavors…not too many competing spices, but the tangy gorgonzola, sweet squash and earthy arugula were great complements of one another. This one’s a keeper. this is excellent – no arugula at supermarket, so i used multi-colored swiss chard sauteed in olive oil for a couple of minutes. my husband and i ate all of it and fell asleep on the floor…the couch won’t arrive for a few weeks…great recipe! hey so i tried this pizza and it is amazing. my only concern was that the crust wasnt quite thick enough…. should i try using more yeast? i think the yeast in london may be weird…. I had to use butternut instead of acorn squash since i couldn’t find any but thinner slices do the trick. A tipp from my side would be to add some separately roasted walut to this. I made this and everything about it was amazing! DO IT! Just made this. You’re right, strangely delicious! I couldn’t find arugula (I know, what?!) and skipped the lemon, but this still turned out. I also cheated and used pre-made pizza dough, but didn’t read the ingredients so that I wouldn’t feel so terrible eating it. Thanks! I wasn’t able to catch Giada make this. Thanks for sharing the recipe. My family really enjoyed it. I made this for the second time tonight and it really is so delicious. Instead of adding the arugula like a salad at the end I’ve been mixing it with a little spinach and covering the squash with it, covering that with more mozzarella, and baking the whole thing. it definitely makes it seem more “pizza-y”. Regardless, thanks for posting this (and everything else you post)! So yummy in my poor, college-student, real-food-craving tummy! This pizza was great! 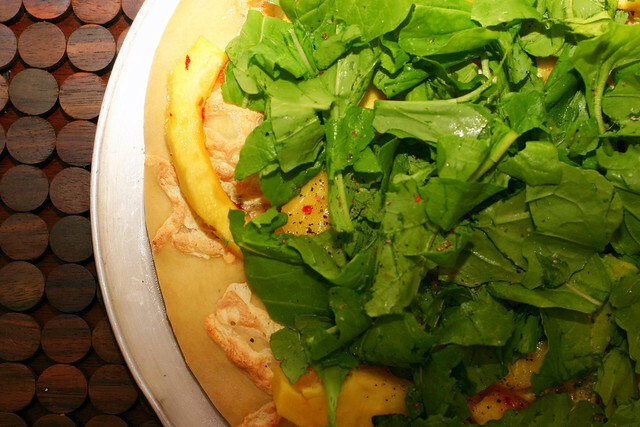 After I put the squash and arugula on the pizza, I put it back in the oven to make it wilt a bit–such a good idea! This pizza is really filling, and the gorgonzola is SO AMAZING. Pink wine is the perfect addition. Watching the bachelor also doesn’t hurt. FAB! I used butternut. A new fave!! This pizza was awesome! I make one with pureed butternut squash (with a little nutmeg and cinnamon) as the sauce and braised leeks and goat cheese as the toppings. There’s just something about squash and pizza coming together that makes me melt! Longtime reader, first time commenter. Rather than doing my work, I was hitting your Suprise Me! button and stumbled upon this entry. I was a lucky girl and got to spend this winter in Rome. Let me tell you, they will put anything on a pizza. Hot dogs and french fries, thin ribbons of zucchini, and my personal favorite roasted pumpkin with mascarpone! Thanks for the great recipes and inspiration. I love just about everything you post. I can’t ever take credit for anything I serve guests because it is all found via you, but they are always raving about the food! This pizza is delicious, and I found that I liked it even better on day 2! I took this to a potluck last winter and it was gone in minutes and was the talk of the party!! Here I am making it again a year later… YUM! Made this today with a few changes–I used trader joes whole wheat pizza dough and cooked with half the cheese (fresh mozzarella) for 10 mins then added spinach (not an arugula fan) topped by the roasted squash and the remaining cheese. Cooked another 15 mins or so. I liked combining the squash and greens into the pizza rather than adding on top after. I “smooshed” up the squash rather than leaving it in the half moons. turned out great! Just made this and loved it! We used goat cheese instead of gorgonzola and it was wonderful. Glad to add this to our pizza arsenal. I just made this today and it was fantastic! I cut up the squash instead of leaving them as half-moons, and the distribution was great. I started cooking the pizza with most of the cheese, then added the rest when I added the squash about 5 minutes before it was done. I also added some toasted pine nuts on top of the tossed arugula. We had this last night and leftovers for lunch today (I made two pizzas) and it was great. I used feta instead of gorgonzola (don’t think they sell organic gorgonzola and I’m scared to use non-organic) and I used a mix of spinach and arugula because I couldn’t find just arugula at the store. LOVE! The spicy squash, Gorgonzola, and arugula are so great together. My husband loved it too, and didn’t notice the absence of meat. I made a parmesan-almond-olive oil-garlic sauce, threw some roasted beets on top, and used dandelion greens instead of arugula. Awesome! Thanks for the idea. Agree with Karen, they put everything on pizza in Italy and often don’t have tomato sauces. They are extremely inventive and it’s us in America that lack imagination with pizza and are afraid to do crazy combos…or at least some of us are. Tonight, I’m making this pizza! This is an amazing recipe! We’ve made this several times exactly as written (unusual for me) and it’s been requested for New Year’s Eve. Hopefully it will go well with champagne… Thanks for a fabulous recipe and an awesome website. Here’s to a 2014 filled with great food! I loved this pizza. I made it exactly as written and it came out beautifully! Thanks for the inspired idea–helped me use the arugula and squash from my CSA. This is my new obsession. So much so that I’m slightly embarrassed to admit how many times I’ve already made this so far this Fall.